I want to stay in the loop about visiting Frederick! 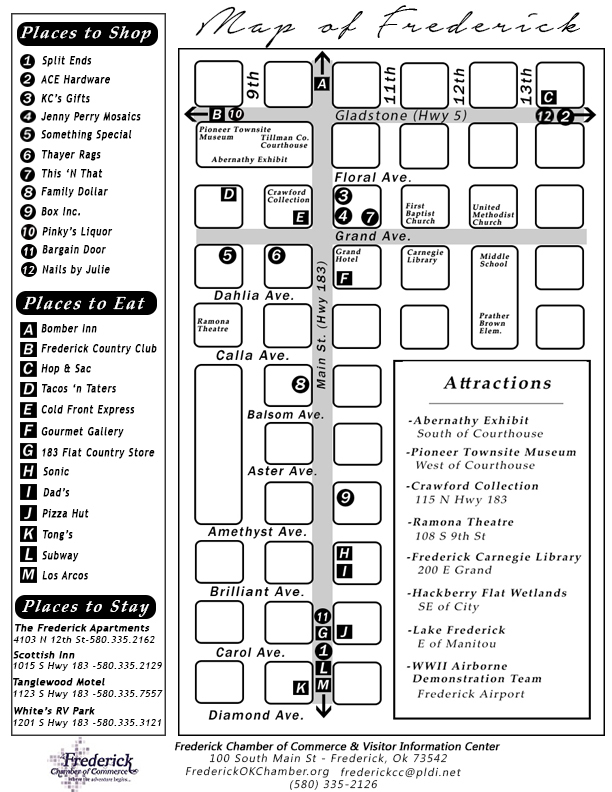 Make Frederick, Oklahoma your tour group destination! We are an adventurous community full of small-town charm and we’d love to share that with you. Behind the scenes stories from local tour guides. Easy arrangements and exclusive access to private attractions. The Frederick Chamber is a non-profit organization, and most of our attractions operate on donations and volunteer time. For that reason we try to keep our tour cost at a reasonable expense for both parties. For large groups we have set prices that simplify your arrangements. These prices are on a “per head” basis and designed for large touring groups of 10 or more. Our local Arts Council will sometimes partner with us to create a wonderful meal for special groups, or we may arrange for a caterer or local restaurant to impress your palette. All details can be arranged to your groups’ liking. For more information or to start scheduling your group tour today, please contact our office at 580-335-2126 or e-mail us at frederickcc@pldi.net. Also, don’t forget to check out our list of Annual Events! These events make great tour dates, especially our wildly popular Oyster Fry Festival and Craft Show, held each year. Let your adventure begin today! Sign me up for the VISIT FREDERICK Newsletter!